If you are lucky enough to live close to a California Pizza Kitchen and lucky enough to have already tried their Thai Crunch Salad, you will be thrilled with my post today. If not, how does this sound? Napa cabbage is tossed with romaine lettuce, julienne carrots, sliced green onions, avocados, shelled edamame and roasted peanuts in a spicy cilantro lime dressing and then DRIZZLED with thai peanut sauce. Crazy good. Crazy good. I have to credit my beautiful daughter for her suggestion during our umpteenth visit to CPK, one where I pretended to peruse the menu, knowing all along I would order my favorite salad. 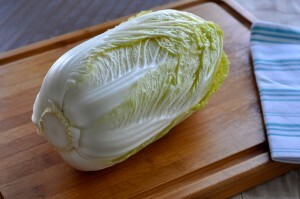 I love the napa cabbage in this recipe. Napa cabbage originated in Beijing, China and is used extensively in Asian cuisine. It’s less crunchy and milder than regular cabbage. Right after we got married, my husband’s family introduced me to their tradition of eating cabbage every year on New Year’s Day. In the German culture, eating cabbage on New Year’s Day results in good luck, happiness and health in the upcoming year. 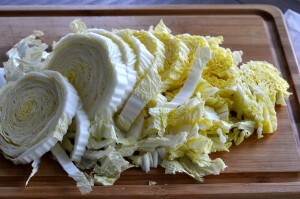 Since I am Irish, this was new to me – we eat our cabbage on St. Patrick’s Day. We snuggled in at home on New Year’s Eve this year, so I had lots of energy to cook on New Year’s Day. 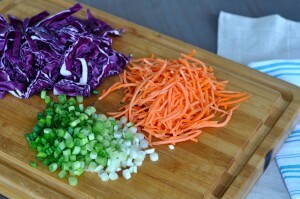 We enjoyed this wonderful Thai Crunch Salad (with cabbage) and are looking forward to a healthy and happy coming year! Don’t be daunted by the long list of ingredients for this recipe. They are readily available at the neighborhood supermarket and also give you a good start toward building a well stocked pantry for Asian cooking. The dressing and the drizzle are both a snap to make, just assemble the ingredients for each into the food processor and give it a quick whirl. Place salad ingredients in a large bowl and toss. 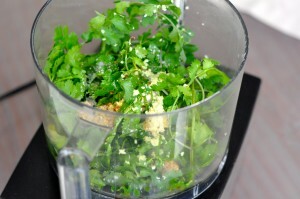 Pour Lime Cilantro Dressing (below) over salad and toss to mix. 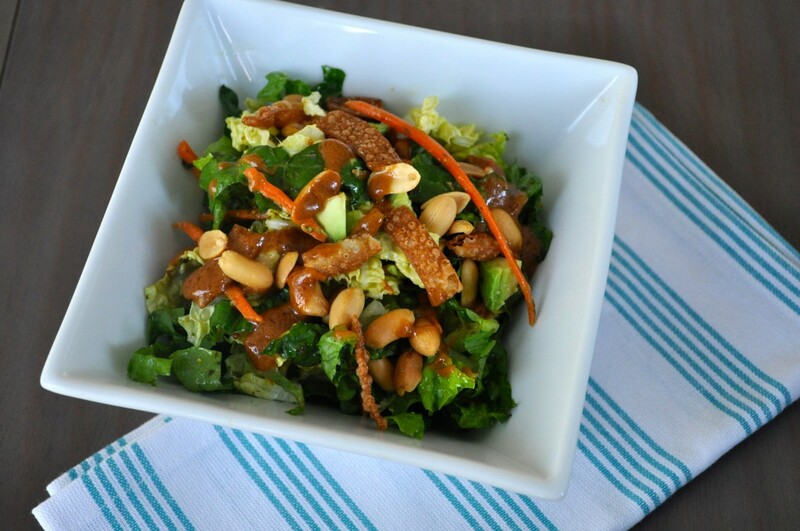 Drizzle the Thai Peanut Drizzle (below) over the top of the dressed salad. Sprinkle with fried wonton strips or chow mein noodles. Serve immediately. 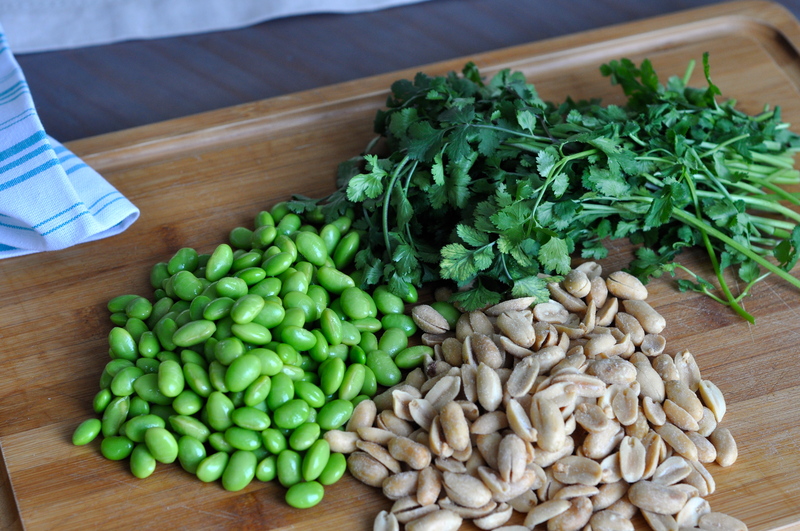 If you are assembling salad ingredients early, wait until right before you serve to add the avocado, peanuts, dressing and drizzle. Assemble all the lime cilantro dressing ingredients except for the olive oil in the bowl of the food processor. 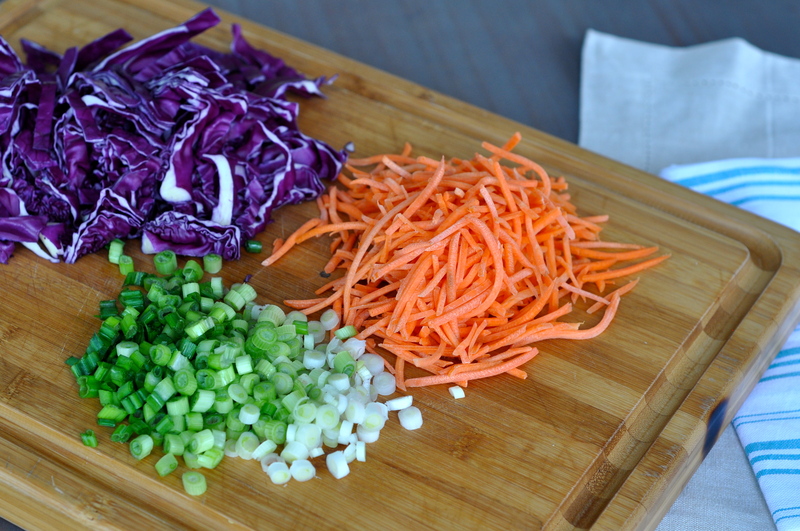 Pulse a 3-4 times to chop. 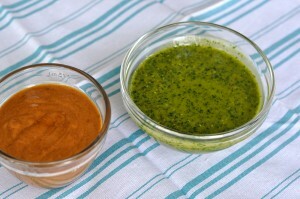 With the food processor on, slowly stream the olive oil into the dressing to create an emulsion. Pour into storage container. Can be prepared ahead and refrigerated for a couple days. Assemble all the drizzle ingredients in the bowl of the food processor. Pulse a 4-5 times to chop and combine. Add a little drop of water and pulse again if too thick. Pour into storage container. Can be prepared ahead and refrigerated for a couple days. LOVE me some at-home CPK action! I have made this several times since Cathy made it for our work family, and I’m making it again today for a Memorial Day BBQ. It is so delicious and my children even love it! Thanks, Cathy!